Are you working on articulation carryover and need some phrases in a format other than worksheets? Well, look no further! I have what you need! 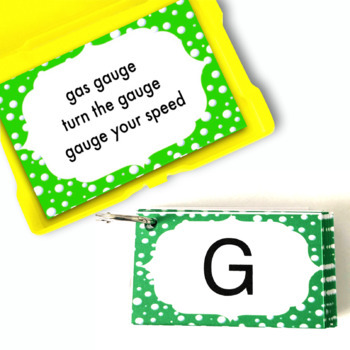 Phrase cards for drill and practice of F, K, G, R, S, L, SH and TH sounds! 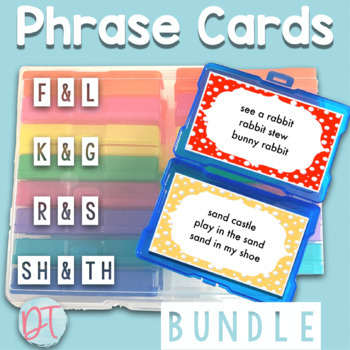 Save 20% by buying this bundle of Articulation Phrase cards! • 240 stimulus phrase cards for initial and final positions of words. • You get a total of 720 phrases. If you own these sets you will not want to buy this bundle. These were created to provide stimulus targets for your students (readers). Kids love the novelty of using cards and not a worksheet in therapy! 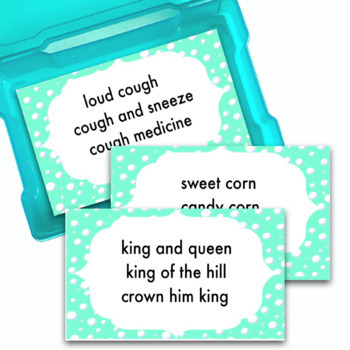 These are great to use with my open-ended games or any of your favorite games! Give each student their own deck to use. These cards are designed to NOT be themed or holiday oriented so you can use these at any time of the year! ADDED BONUS: It includes duplicated pages of the phrase cards in a simple black and white format.